Today we welcome Jason Marriott to the blog. Jason works for Framework, the charity for homeless and vulnerable people, and explains what you can do to help those you see begging on the street. There is a girl sat by the cash machine. A blanket over her legs, a cup in front of her. A group of drunken men wander past, they ignore her. It’s very cold. A lady finishes at the cash machine and bends down speaking to the girl. After a few minutes she goes and gets a cup of coffee from the nearby MacDonald’s and brings it back to her and also gives her a £5 note. The girl looks absolutely delighted and thanks the lady over and over again. The lady walks away, smiling, a good dead done for the day. Everyone is happy, for that moment. I go up and speak to the girl. I have known her for many years. I know where she lives. I know that she has a heroin and crack cocaine habit as does her long term abusive partner who I have noticed is sat in the bus stop opposite, watching. I know her drugs worker and her tenancy support worker. I also know that the £5 will soon be passed to the abusive partner who will go and spend it on heroin and crack cocaine and that the tireless work of the drugs worker and tenancy support workers has just been undone, again. Has the lady really helped? Could she have done anything differently? The lady thought the girl was homeless, alone and frightened. This is what the girl had told her. It is what she will tell anyone that takes the time to stop and speak to her. What is anyone supposed to do when faced with that information? I mean, it’s only £5…. even those of us that think that the money may be spent on alcohol or drugs have sympathy, after all, she is homeless, what else can she do to get her through the cold nights? I manage a Street Outreach Team that works with rough sleepers. If anyone is rough sleeping in the areas that we work in then there is every chance we know who they are and are working on a support plan for them to exit that lifestyle. Occasionally though, someone new will arrive on the streets, someone we don’t know. Of course we walk around in the early hours and late evenings looking for people, but we are a relatively small team. Therefore, it is members of the public that can have the biggest impact on supporting us to support rough sleepers. If anyone stops to speak to someone who says they are sleeping rough or sees someone bedded down in a doorway, it is often difficult to know what to do. Do you buy food, ignore them, ring the Police or give money? 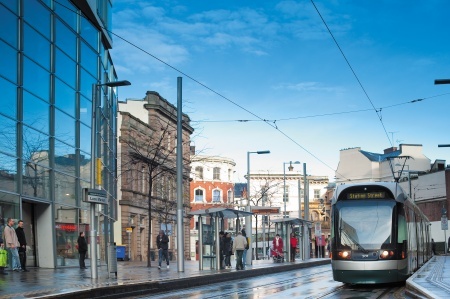 Across England now there is a new service called Street Link. If people truly want to help then all they have to do is call the Street Link number or go to streetlink.org.uk and report details about that rough sleeper. That will link that person directly into a support service in that area who will have to respond and will look to supporting that person through their homelessness. In Nottinghamshire, Lincolnshire and Rutland, that team will be us. We currently receive an average of 15 referrals a day, including the girl at the cash point. Contrary to public belief, the vast majority of people begging in our streets are not homeless. This does not mean that they are not in need of support, but the story they give is just that. A story. As a Manager of a homelessness service I would urge people to never give to beggars. There is a wonderful amount of support services out there to support people through the difficult times and that is all people need to be directed to. By giving directly to people begging on our streets a lot of that wonderful work is undone and rather than helping, the giving is a having a hugely damaging impact on that persons well being and may be fuelling the harmful drug and alcohol use that could eventually kill them. If you think someone is rough sleeping in Nottinghamshire, Lincolnshire or Rutland please call us 24 hours a day on 0800 066 5356 or text SOT to 80800 for free. If you think someone is in a medical emergency please call 999.